There have been no Severe Thunderstorm Warnings issued in the Tri-State so far this year. That is an incredible statement to make in late March. 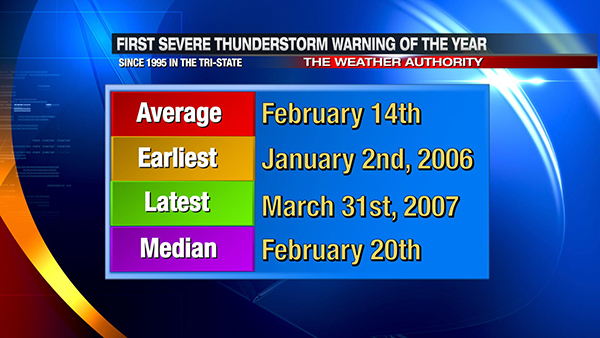 Note that the latest first Severe Thunderstorm Warning of the year and in the Tri-State was on March 31, 2007. There will be no severe thunderstorms in the Tri-State today, and there will be no severe thunderstorms tomorrow; this means – using the first Severe Thunderstorm Warning of the year as a measure – this will be the latest start to the severe weather season on record (since the National Weather Service forecast office opened in 1995). 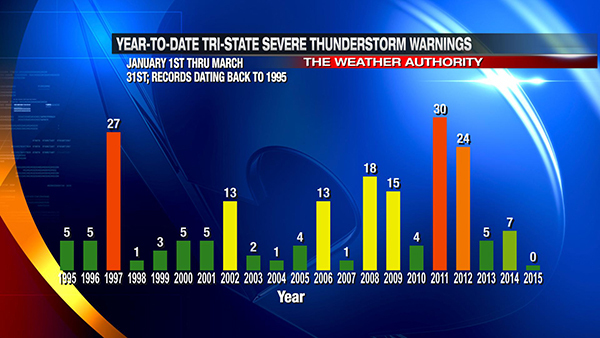 Since 1995, there have been 3 years with 1 Severe Thunderstorm Warning issued in the first 3 months of the year. One could make the argument that we are barely setting a new record, and that is true. The argument I make here is that a record is a record. 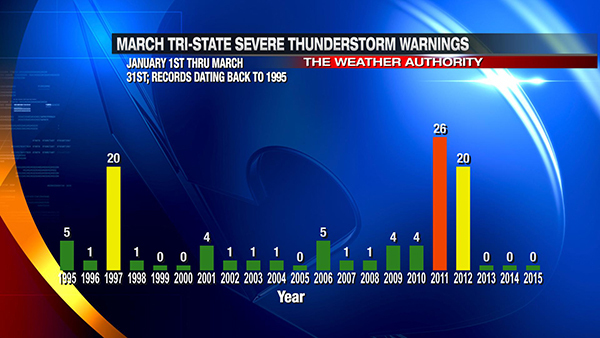 It is common to go through March without severe storms, but it is uncommon to go through the first 90 days of the year without at least onr severe storm. On average, 2 Severe Thunderstorm Warnings are issued each January, and 3 are issued each February. We have beat the odds for three straight months. This stretch (since the beginning of the year) is not the all-time stretch between two Severe Thunderstorm Warnings. The last Severe Thunderstorm Warning issued in the Tri-State was issued on the afternoon of December 24, 2014 for Highland and Adams County (about 98 days ago). The record for the longest period of time between two warnings in the Tri-State is 216 days (between warnings issued on August 27, 2003 [Clinton County] and March 30, 2004 [Adams County]). While strong storms are a possibility later this week, we are not currently set in a severe weather risk. This may change; if it does, this change in the pattern will be overdue. Be prepared!